Planners routinely create plans, reports, and guides to capture research, recommendations, program or process details, and stakeholder input. Creating these deliverables is a complex undertaking. Teams must work within project budgets and meet multiple deadlines while coordinating the involvement of collaborators representing different sectors, stakeholder interests, and levels of government. A key element of successful planning processes or analyses can be whether the final report communicates project outcomes correctly, clearly, and compellingly. Creating Planning Documents aims to advance planners’ ability to create successful planning documents and reports. 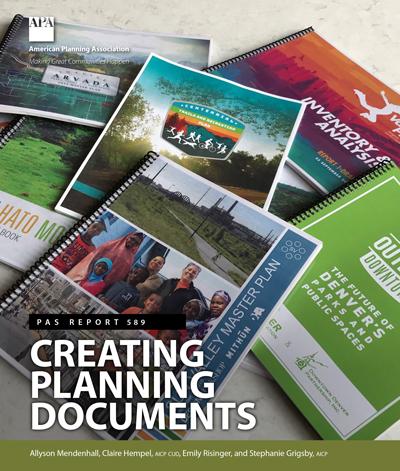 Written by planning practitioners and based on hard-earned experience, this PAS Report standardizes guidance for planning documentation. It offers tools and knowledge required to create first-class planning documents by containing project scopes and using efficient processes. Seven chapters guide readers through the documentation process from concept to delivery, with checklists and templates to help track and coordinate production efforts. The recommended practices detailed in Creating Planning Documents are valuable resources that will help any planning office efficiently produce high-quality planning documents. As an added feature, APA has created editable versions of templates in the report for planners to customize for their own projects. Members and PAS Subscribers: Click here for the bonus content. Nonmember Purchasers: You will receive an email from APA with a link to the bonus content after you purchase the report. Allyson Mendenhall, PLA, LEED Green Associate, is the director of Legacy Design at Design Workshop and a principal in the Denver office. She leads initiatives related to practice-based research, project sustainability agendas, and protocols for project and quality management. Claire Hempel, AICP CUD, PLA, LEED Green Associate, is a principal in Design Workshop’s Austin office. She oversees a wide range of planning and design projects, and has led numerous comprehensive community and environmental planning efforts. Emily Risinger, LEED Green Associate, NCI CS, is an associate at Design Workshop and executive director of the Design Workshop Foundation. Her work is recognized through many awards and speaking engagements. Stephanie Grigsby, AICP, PLA, LEED Green Associate, is a principal in Design Workshop’s Lake Tahoe office and serves on the board of directors of the Landscape Architecture Foundation. Design Workshop is an international practice providing landscape architecture, land planning, urban design, and strategic services to developers, government agencies, institutions, and other clients engaged in improvements to the land.